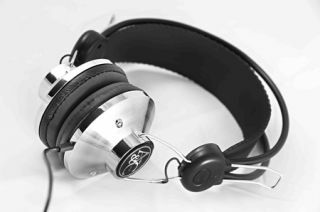 Angle & Curve joins the UK headphone market with £60 Classic | What Hi-Fi? Never heard of Angle & Curve? Nor had we, but the company is poised to enter the UK market with its first pair of headphones, the Classic, costing £60. They're designed in-house by the firm's own audio engineers, designers and DJs, based in London's Covent Garden. "The Classic offers all the advantages and features of other top-end headphone brands, but with a cutting-edge twist in style and fit," the firm claims. Twin 40mm drivers nestle within the retro-look chrome enclosures, delivering a frequency response of 20Hz to 20kHz, an impedance of 32 Ohms and sensitivity of 97+/- 3dB. Designed for use with any device sporting a 3.5mm input, the Classic can be had in the chrome finish shown here, or alternatively four other finishes: rose gold, jet black, dark navy or matt white.